The Baird Institute was opened as a museum in Cumnock in 1892. It has an area dedicated to the Covenanters of the district. 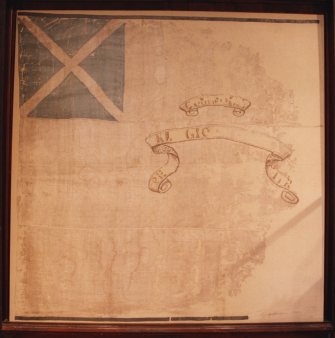 The Cumnock flag is on permanent display in the museum. It is thought to have been carried at Drumclog in 1679. It was found in a loft in Cumnock in 1830 and was carried at marches in the town at the Reform Bill in 1832. It was presented to the museum in 1925 and was restored in 1979. A wooden bowl belonging to John Brown of Priesthill is on display. It has a crack and hole in it that is supposed to have resulted from a bullet hitting it. A short walking stick with metal ends associated with Rev Alexander Peden is on display. It is thought it may have been eighteen inches longer at one time. A small locket contains some hair and a piece of cloth taken from the Covenanters buried at Carsgailoch Hill when the monument was being erected. It was held by the farmer at Dalgig for many years. A fragment of the original gravestone is preserved in the museum. It is thought that it was originally erected by Robert Paterson, the 'Old Mortality' of Sir Walter Scott's book of the same name. A replica of Peden's 'false face' made by Justin Wilson for the museum is on display. The original is in the National Museum of Scotland in Edinburgh.